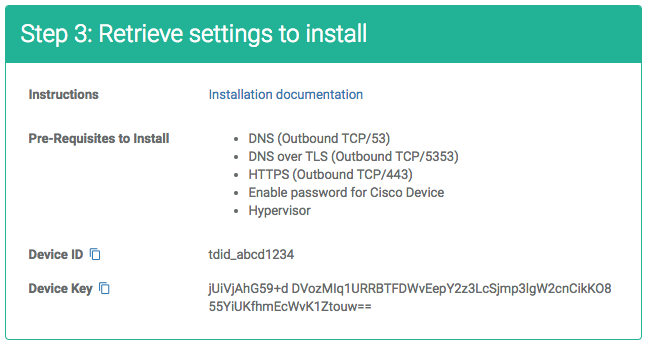 This document describes the step to configure a Cisco ISR using the ThreatSTOP Centralized Manager with Web Automation enabled. Internal IP address: This is the internal address of the device. The TSCM will communicate with the ISR via SSH using this IP address. Note: Authentication credentials are documented below. Object Group Name (Block List): the name of the Object Group that the TSCM will use to store the subnets in the Block List generated by your Policy. Object Group Name (Allow List): the name of the Object Group that the TSCM will use to store the subnets in the Allow List (whitelist) generated by your Policy. Maximum Policy Size: select the highest number of ACLs supported by your ISR. If the policy becomes larger than this setting, the TSCM will truncate it down to the Maximum Policy Size. The TSCM supports the following advanced settings, which cover uncommon ISR configurations or network environments. Syslog IP address: Typically, logs will sent over syslog by the device itself. If logs are sent by another IP address (for example, after being processed by a SIEM), that IP address should be configured in this field. Once the configuration is retrieved, tsadmin will prompt for credentials for the ISR device. They will be used to connect to the device but will not be stored outside of the TSCM image. At this time, the TSCM has succesfully linked itself to the device entry, and validated its ability to reach the ISR device.